304 Berkeley is located on the west side of Berkeley, between Beacon and Marlborough, with 149 Beacon to the north, across Alley 420, and 302 Berkeley to the south. 304 Berkeley was built ca. 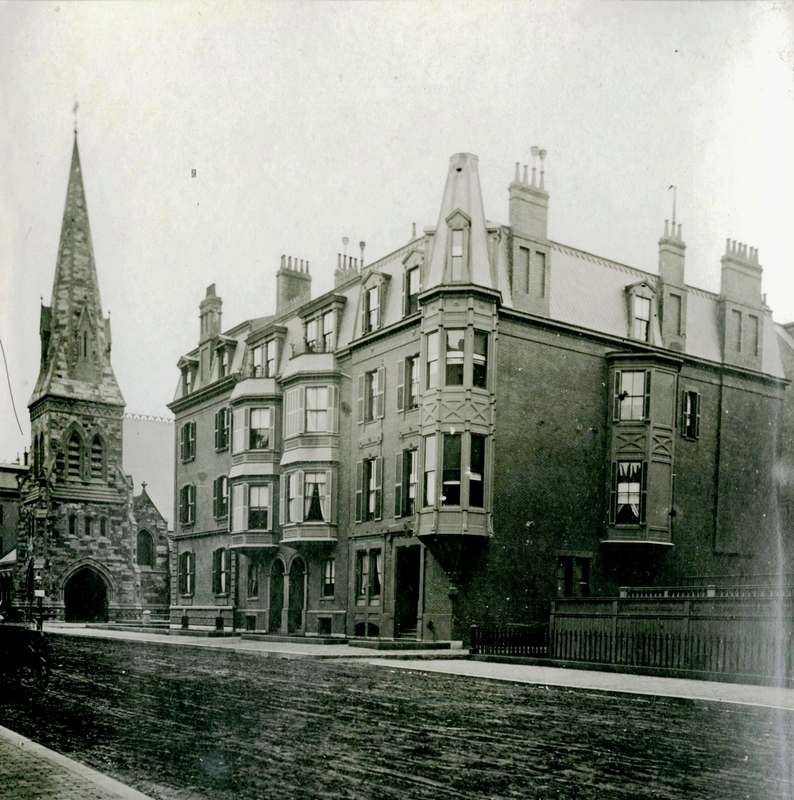 1869 and is distinguished by an unusual corner oriel window that extends through the mansard roof. It was built for Marianne (Mason) Crafts, widow of textile manufacturer and merchant, Royal Altamont Crafts. She previously had lived at 16 Marlborough. 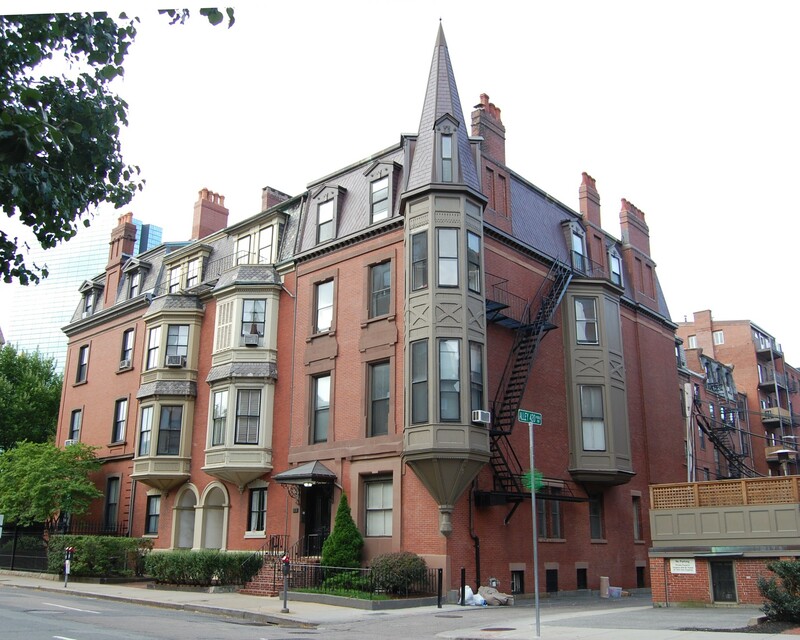 Marianne Crafts bought the land for 304 Berkeley on March 18, 1868, from building contractor George Wheatland, Jr., who had recently completed 300-302 Berkeley. He had purchased the land on December 14, 1867, from Horace Gray, Jr., an Associate Justice of the Massachusetts Supreme Judicial Court and later Chief Justice of the Massachusetts court and then an Associate Justice of the US Supreme Court. 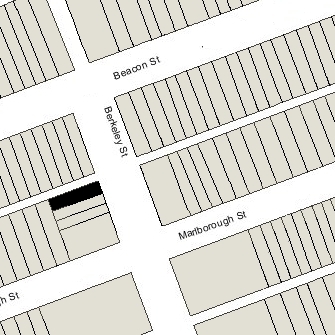 It was part of a larger lot which included the land where 53 Marlborough and 300-302-304 Berkeley would be built. Horace Gray, Jr., had acquired the lot on August 8, 1863, from shipping merchant and real estate investor John Lowell Gardner, whose sister, Sarah Russell (Gardner) Gray, was Horace Gray, Jr.’s step-mother. John L. Gardner had purchased the land from the Commonwealth of Massachusetts on May 2, 1860. Click here for an index to the deeds for 304 Berkeley. In November of 1871, Marianne (Mason) Crafts married again, to retired US Navy Commodore Francis Bleecker Ellison. Commodore Ellison had joined the Navy in 1819. He was promoted to Captain in 1850 and to Commodore in 1864, and retired in 1870. He had been married twice previously. Francis and Marianne Ellison lived at 304 Berkeley. Francis Ellison died in January of 1884. 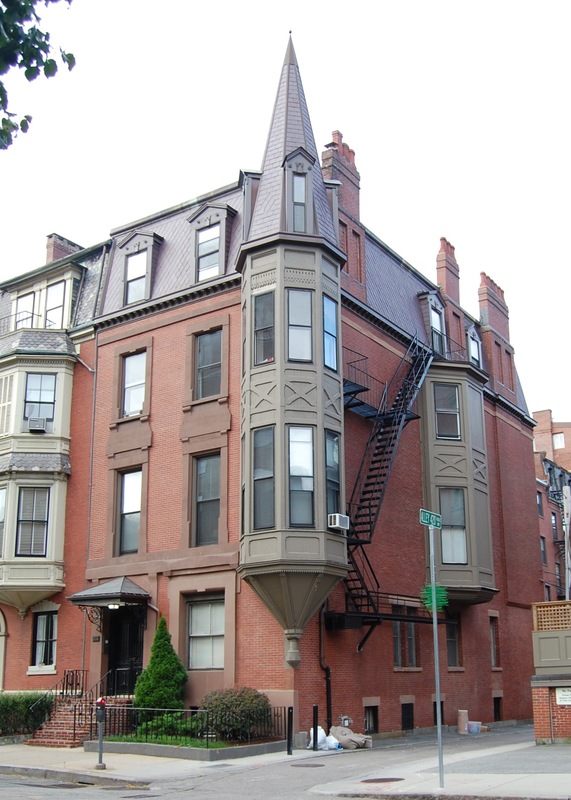 Marianne Ellison continued to live at 304 Berkeley until her death in January of 1897. On October 12, 1897, 304 Berkeley was acquired from Marianne Ellison’s estate by Jane Norton (Wigglesworth) Grew, the wife of Henry Sturgis Grew. They lived at 89 Beacon and in Hyde Park. 304 Berkeley became the home of the Grews’ son-in-law and daughter, note broker and banker Stephen Van Rensselaer Crosby and Henrietta Marian (Grew) Crosby. They previously had lived at 24 Chestnut. On August 7, 1900, Jane Grew transferred 304 Berkeley to her daughter. 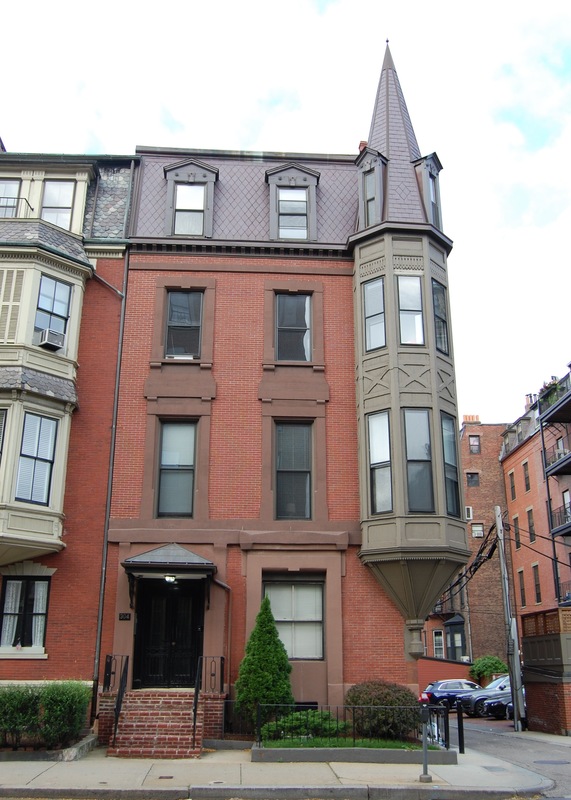 Stephen and Henrietta Crosby continued to live there until 1912, when they moved to 95 Beacon. The Crosby’s two children were born at 304 Berkeley: Henry Grew Crosby in June of 1898 and Katherine Schuyler Crosby in February of 1901. Henry (Harry) Grew Crosby married in September of 1922 to Mary (Polly) Phelps (Jacob) Peabody, the former wife of Richard Rogers Peabody. Prior to her first marriage, Mary Jacob had invented the first brassiere, for which she held a patent. After their marriage, Harry and Polly (known as Caresse) Crosby moved to Paris, where they founded the Black Sun Press, an English language press that published the works of many of the modernist authors of the day, including James Joyce, D. H. Lawrence, and others. The Crosbys were at the heart of the expatriate Bohemian society of 1920s Paris. Harry Crosby died in December of 1929 in a highly-publicized murder-suicide or double suicide with his lover, Josephine Noyes (Rotch) Bigelow, the wife of Albert Smith Bigelow, Jr.
On July 6, 1912, 304 Berkeley was purchased from Henrietta Crosby by Miss Blanche Shimmin. 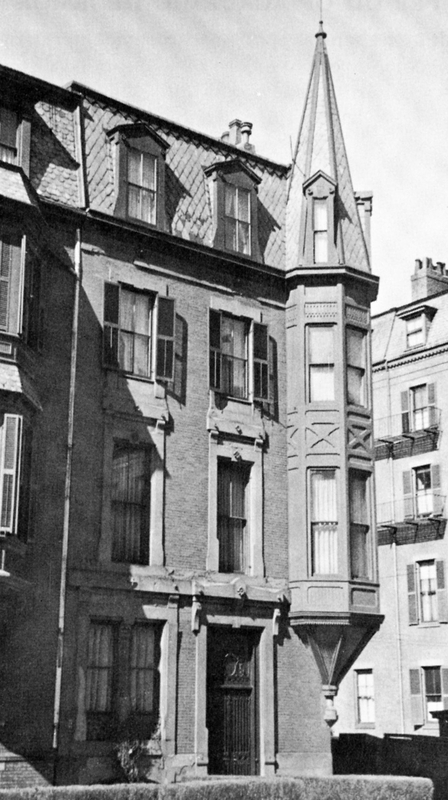 She previously had lived at The Ludlow (southwest corner of Clarendon and St. James). She lived at 304 Berkeley until her death in December of 1912. By the 1912-1913 winter season, 304 Berkeley was the home of John Gardner Coolidge and his wife, Helen (Stevens) Coolidge. He was retired from the US Diplomatic Corps, having served in France, China, Mexico, and Nicaragua. They continued to live at 304 Berkeley during the next season, and then moved 130 Beacon to live with his parents, Joseph and Julia (Gardner) Coolidge. On July 31, 1916, 304 Berkeley was purchased from the trustees under Blanche Shimmin’s will and her niece, Marian (Jeffries) Means, by Charles Henry Taylor, Jr.. Marian Means was the wife of James Howard Means and the daughter of Benjamin J. Jeffries and Marian (Shimmin) Jeffries. Charles Taylor, Jr., and his wife, Marguerite C. (Falck) Taylor, made 304 Berkeley their home. They previously had lived at 93 Beacon. They also maintained a home in Buzzards Bay. From 1929, the Taylors were joined at 304 Berkeley by their daughter, Doris (Taylor) Black, the former wife of Percy G. Black, and their children, Peter and Marguerite Black. Charles Taylor died in August of 1941. Marguerite Taylor continued to live at 304 Berkeley until about 1946 (she died in August of 1949 in Westwood). 304 Berkeley was shown as vacant in the 1947-1950 City Directories. On October 17, 1949, 304 Berkeley was purchased from Charles Taylor’s estate by Harold Realty, Inc. (Louis Theran, president). He converted the house into ten apartments. The property changed hands and on June 30, 1969, was acquired by Richard R. Brady, who lived in one of the apartments. He previously had lived at 98 Pinckney. He continued to own 304 Berkeley until his death in August of 1991. 304 Berkeley changed hands. It remained an apartment house in 2015.